Drunk Driving Simulators - Can They Teach Teens? It's no secret that drinking and driving is an incredibly dangerous activity. Unfortunately, this is even more true for the young drivers out there. In 2010 alone, for instance, a full 22 percent of drivers between the ages of 15 and 20 who were involved in fatal crashes had been drinking alcohol. These statistics are disheartening, and have led to the creation of various driving while intoxicated (DWI) simulators that those in the educational field are using to protect our teens. There are several ways in which the conditions experienced while drinking and driving can be duplicated. Oftentimes, the type of simulation used is contingent on the financial assets of the organization employing the simulator. Virtual simulators put a screen in front of a person, often in the actual windshield of a vehicle, and allow them to drive virtual streets. The amazing thing about these simulators is that they reduce a person's ability to turn the steering wheel and apply brakes to simulate the lessened reaction time experienced while drinking and driving. Most people have seen the eye wear dubbed as "beer goggles." 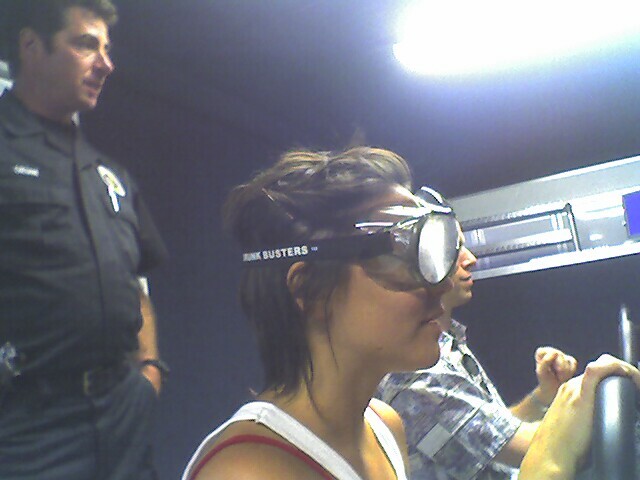 These are goggles that, when worn, alter a person's vision enough to experience what being under the influence is like. An individual can then sit at a normal driving simulator, oftentimes just at a computer, and attempt to drive a normal virtual driving course. While these types of simulations may not fully model a person's reduced reaction time, the simulated visual impairment is often enough to make the point. Some companies have actually taken the simulation idea to the next level. Go-carts have been built with the ability to prevent a person from driving and braking as quickly as they normally would. This simulation is much like the aforementioned complete virtual simulation, but instead of computer graphics, a person is actually driving around and really seeing the effects of drunk driving. Drunk driving simulations at schools have been in the news all the way from New Mexico to the United Kingdom and beyond. A complete virtual simulation program used at Portales High School in New Mexico, for instance, actually allowed students to get into virtual crashes and even hit pedestrians. Once these mistakes were made, students were given fake tickets and informed of what the real world consequences would've been had the simulation been real. And these consequences can be dire. In New Jersey, for example, the DWI defense firm of Evan Levow attorneys states that offenders can be slapped with suspension of their driver's license, along with racking up thousands of dollars in fines and increased insurance premiums. Parents, too, can utilize drunk driving simulators as tools to educate the teens in the family about what happens when they get behind the wheel after a few drinks. Using the aforementioned go-cart simulators, parents are able to show their teens first-hand how dangerous drinking and driving can be. These simulations are sometimes brought around by non-profits who just want to help out at schools, but there are also companies who end up turning a profit by helping to keep our teens safe. Teenagers are already more likely to be involved in car accidents than others simply due to their inexperience. When this inexperience is combined with alcohol, however, the results can be disastrous. The aforementioned simulators can go a long way in showing teens the risks that they're taking by driving while intoxicated. While these simulators will not prevent every teen from drinking and driving, if they even prevent one premature death, then they are well worth it. About author: Richard Freeland is a freelance writer with two sons who were fortunate enough to experience in-school driver training using the "beer goggles." Evan Levow attorneys are New Jersey DWI lawyers who understand that a DWI case is about your life, your freedom, your family and your employment, and will represent you accordingly.